The South Carolina Republican chastised Trump for inviting Putin to Washington this fall. 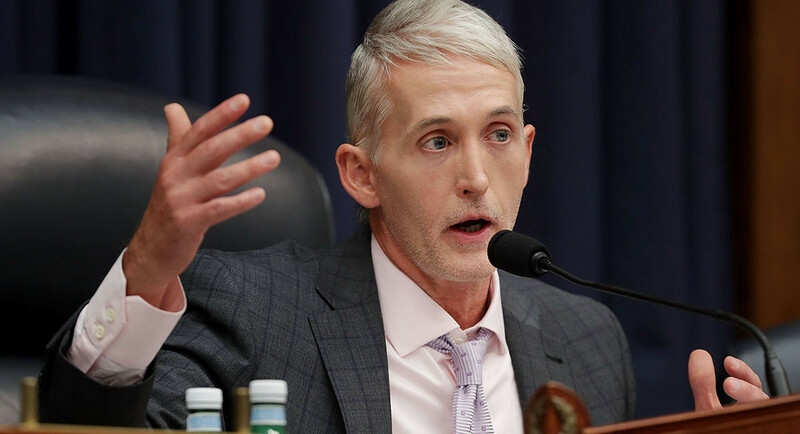 House Oversight Chairman Trey Gowdy chastised Donald Trump for inviting Russian President Vladimir Putin to Washington, saying Sunday that some members of the president’s administration should consider quitting if Trump won’t listen to their advice. The South Carolina Republican suggested that some members of the administration may need to consider leaving if Trump continues to disregard their advice to stand firm against Russia. That concern has dominated discourse in Washington since Trump’s summit with Putin in Helsinki last week, at which he spoke more harshly of the FBI than of Russia. Political commentators and Democratic lawmakers said after Trump’s news conference with Putin — in which he refused to side with the U.S. intelligence community on the issue of Russia’s interference in the 2016 election and said he held both countries responsible for tensions — that advisers including Secretary of State Mike Pompeo, Defense Secretary Jim Mattis, Director of National Intelligence Dan Coats and national security adviser John Bolton should quit their posts. But Republican lawmakers have been more hesitant to call for such a response from the president’s team. “As long as I’m able to have the ability to seek the truth and speak the truth, I’m on board,” Coats said. After Trump indicated Monday that he did not believe Russia was responsible for hacking Democratic Party computers and other wrongdoing during the 2016 election, Coats defended American spies’ assessment that Moscow was to blame. Gowdy struck a tone of admonishment Sunday on Trump’s refusal to side with the U.S. intelligence community — comments that the president later partially walked back. Still, Gowdy urged Trump to separate concerns about Russian interference from his frustration with the investigations into possible collusion between the Trump campaign and Moscow. “I have not seen one scintilla of evidence that this president colluded, conspired, confederated with Russia,” he said. “And neither has anyone else, or you may rest assured Adam Schiff would have leaked it,” he said, referring to the Democratic congressman from California. Congressional Democrats continued Sunday to be skeptical of the response of their Republican colleagues on the Russia issue. Others were just rather startled at the week’s whole turn of events.